Late last year, The Weekend Gourmet team spent a few days exploring the gorgeous Napa Valley. After leaving Sonoma, we made the quick 40-minute drive across the Mayacamas mountain range to Napa on the other side. If you’ve never been to Napa Valley, it’s anchored in the South by the town of Napa and in the North by Calistoga. 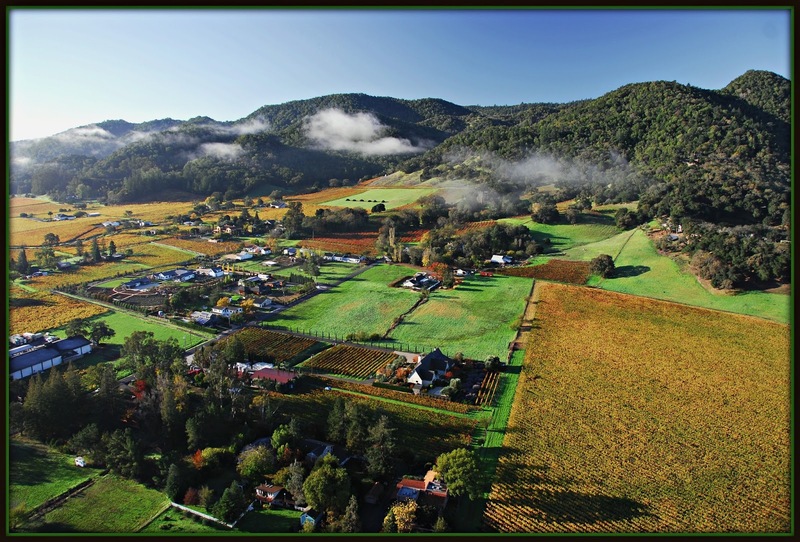 There are two main roads that run the length of the valley – Highway 29 and the Silverado Trail. All along the way, there are small towns with amazing wineries, gorgeous views, and world-class restaurants. Our home base for this leg of our trip was the conveniently located Marriott Napa Valley Hotel & Spa. 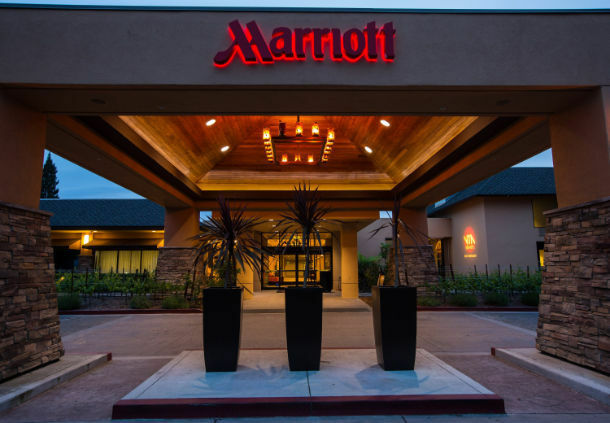 The Marriott is conveniently located just off Highway 29, and it offers a lot of great amenities. 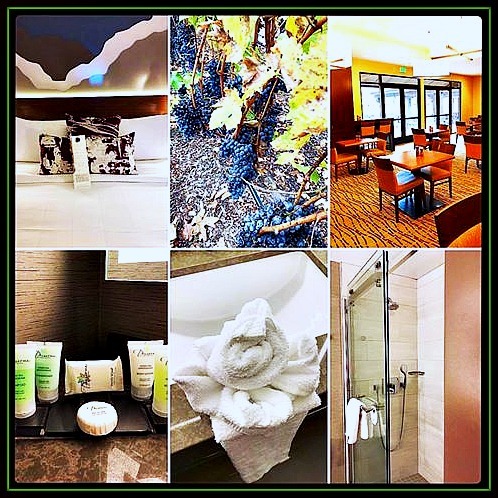 Plentiful on-site parking is free, the newly remodeled rooms are spacious and comfortable, and the staff is welcoming and friendly. As the video shows, the room décor is soothing and peaceful – with tones of the wine the Napa Valley is known for. The spacious bathroom was decorated with white tile and grey granite, and it featured spa toiletries. Every room comes with a modern entertainment system that offers Bluetooth® connectivity and the ability for guests to access their personal Netflix ®, YouTube®, Pandora®, and Hulu® accounts directly from the room’s television. That’s a fabulous touch for bringing a bit of home on vacation with you! 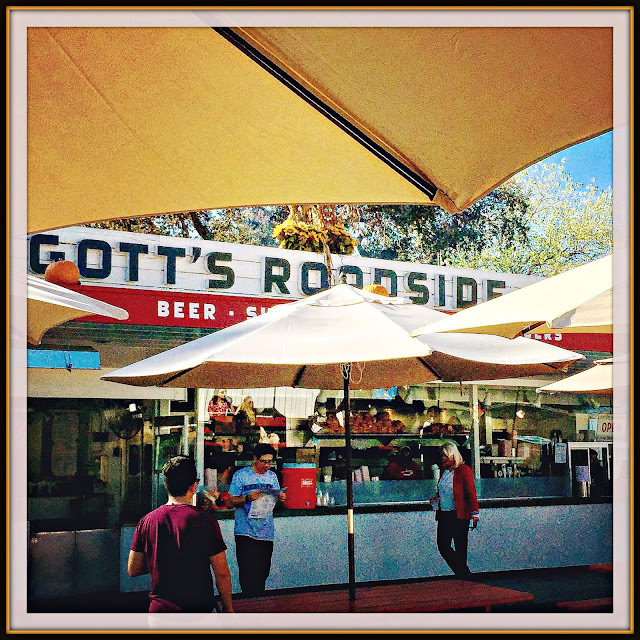 After dropping our bags at the Marriott, we headed out for lunch at Gott’s Roadside in nearby St. Helena. Gott's is a James Beard Award-winning roadside burger stand formerly known as Taylor’s Automatic Refresher! 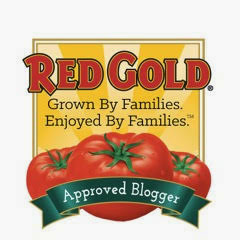 Gott's prides itself on serving 100% Angus beef, locally baked bread, wild-caught seafood, and vegetarian-fed chicken. The food here is definitely elevated fast food! We found plenty of parking and lined up at the order window with other hungry guests. We ordered a range of signature menu items – including the Blue Cheese Burger, Green Chili Cheese Burger, Chicken Tenders, and a California Chicken Sandwich. We paired our entrees with handmade onion rings and Gott’s signature Garlic Fries -- hand-cut fries tossed in garlic butter and parsley. 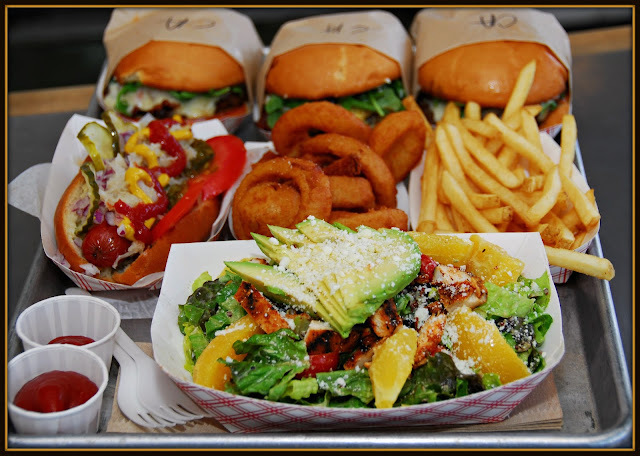 Gott's Roadside offers guests a wide range of burgers, hot dogs, and even freshly prepared salads. There's truly something for everybody to enjoy on their menu -- including wine! Everything was perfectly prepared and amazingly fresh – we ate at one of Gott’s picnic tables while we enjoyed the gorgeous California weather. Gott’s is a must for anybody visiting Napa Valley. The food is amazing, and the prices are easy on your travel budget! 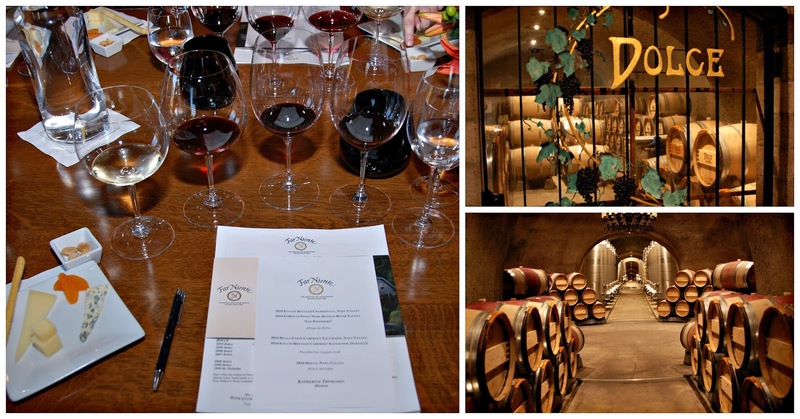 After lunch, we made our way to Far Niente winery for a private tour and tasting. 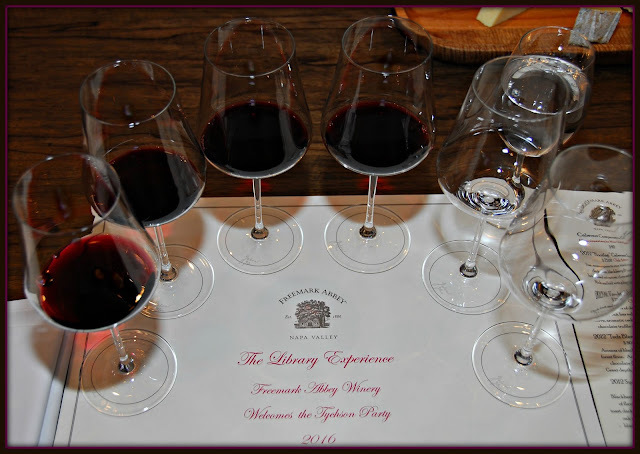 The tasting included five wines -- including current releases and library vintages -- along with a seasonal cheese plate. The grounds of this Oakville winery were absolutely stunning, making for a beautiful drive in! 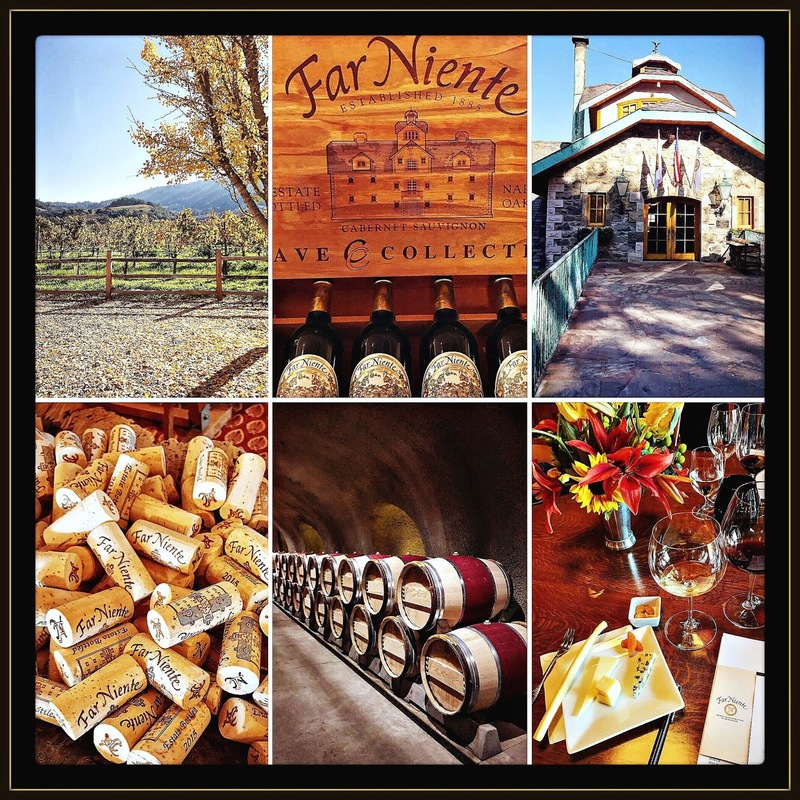 We soaked in the gorgeous scenery as we made our way to Far Niente’s charming tasting room and met our tour guide. It was such a beautiful drive in that we couldn't resist shooting a bit of video of our drive in. We were given a 30-minute private tour of Far Niente’s extensive underground wine caves and beautiful grounds before our guided wine and cheese tasting. All five of the wines we sampled were delicious, but our personal favorite was Far Niente's limited-edition sweet Dolce wine. This late harvest dessert wine -- similar in flavor to ice wine -- knocked our socks off so much that we purchased a bottle to bring home to Texas with us. After our visit to Far Niente, we made our way to Markham Vineyard’s tasting room in St. Helena for their sweetly fun Cupcake & Wine Pairing experience. Markham makes some of our favorite red wine -- including a wonderful Cabernet Franc -- so we were very excited to see how they would pair their wines with a wine-infused cupcake. The cupcake from Sift Dessert Bar was a dark chocolate cake flavored with Markham Merlot, filled with blackberry jam, and frosted with buttercream infused with Markham Cabernet Sauvignon. 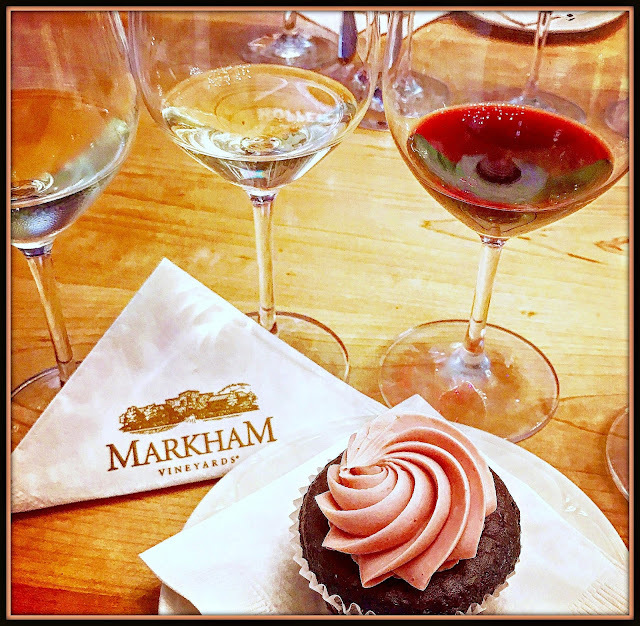 This amazing little cupcake was paired with a quartet of Markham wines. If you've never paired desserts with wine, this is a great tasting to try out. 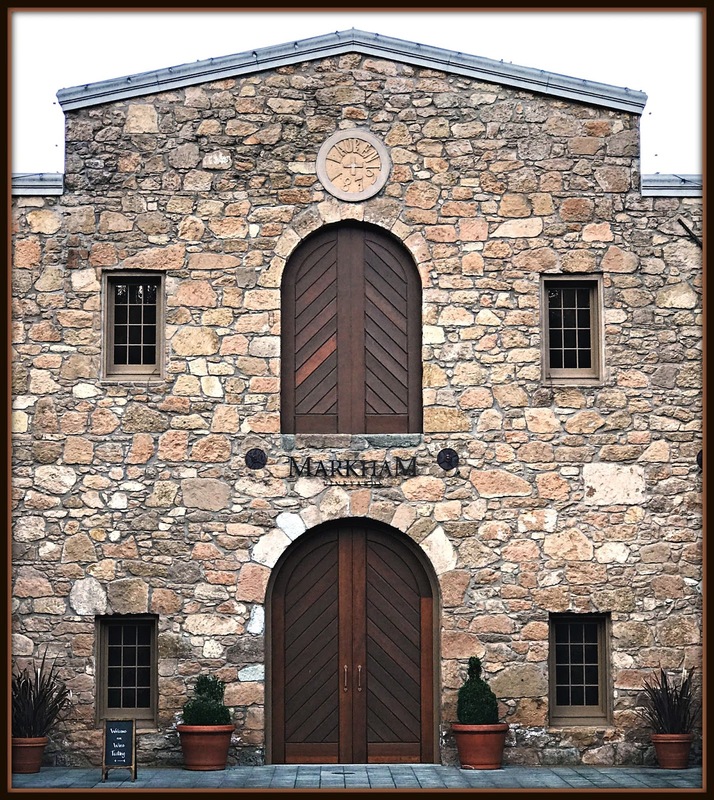 One of our favorite things about visiting Markham's tasting room is checking out its music-inspired art gallery and admiring the photography and paintings on display. Before we knew it, it was time to head back to the Marriott to rest up a bit and get cleaned up for our dinner at Bounty Hunter Wine Bar & Smokin' BBQ in Downtown Napa that night. 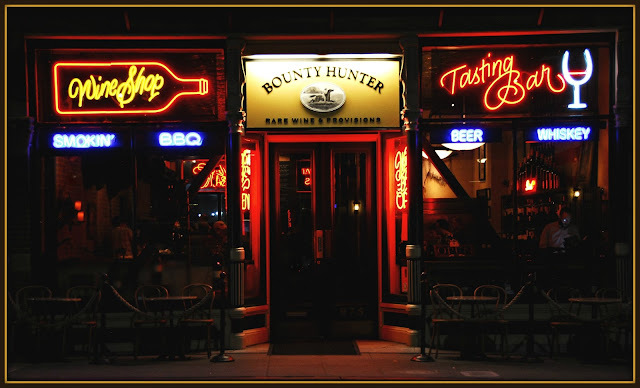 Bounty Hunter is a wine bar that features tons of great wines, delicious made-on-site BBQ, and flavorful side dishes. Bounty Hunter has more than 400 wines on their shelves -- including 40 wines that are available by-the-glass. 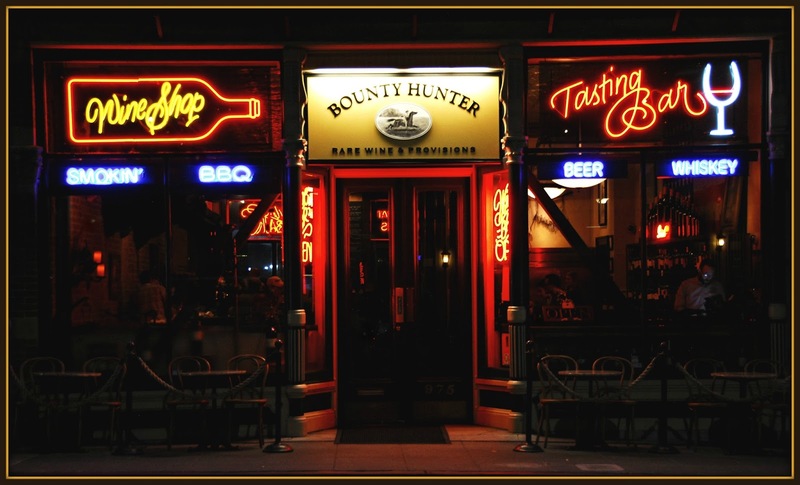 We loved the casual vibe at the Bounty Hunter...as well as their delicious BBQ. The Smokin' BBQ Platter is served family style, and it was plenty for the four of us to sample a bit of everything. This platter included pulled pork, smoked brisket, and slow-smoked ribs. We especially loved their signature fall-off-the-bone tender Beer Can Chicken. The presentation is fun -- and the chicken was juicy and full of flavor! 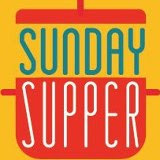 For sides, we enjoyed cole slaw, potato salad, decadent baked mac and cheese, and half-sour pickles. 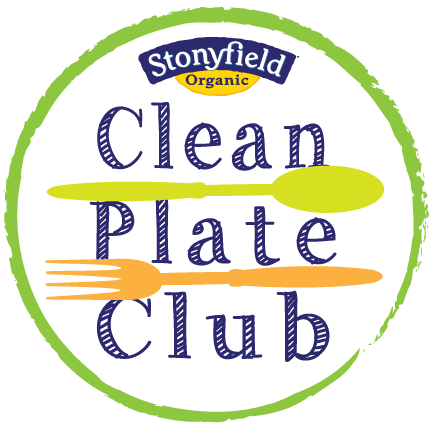 Everything was cooked to perfection! 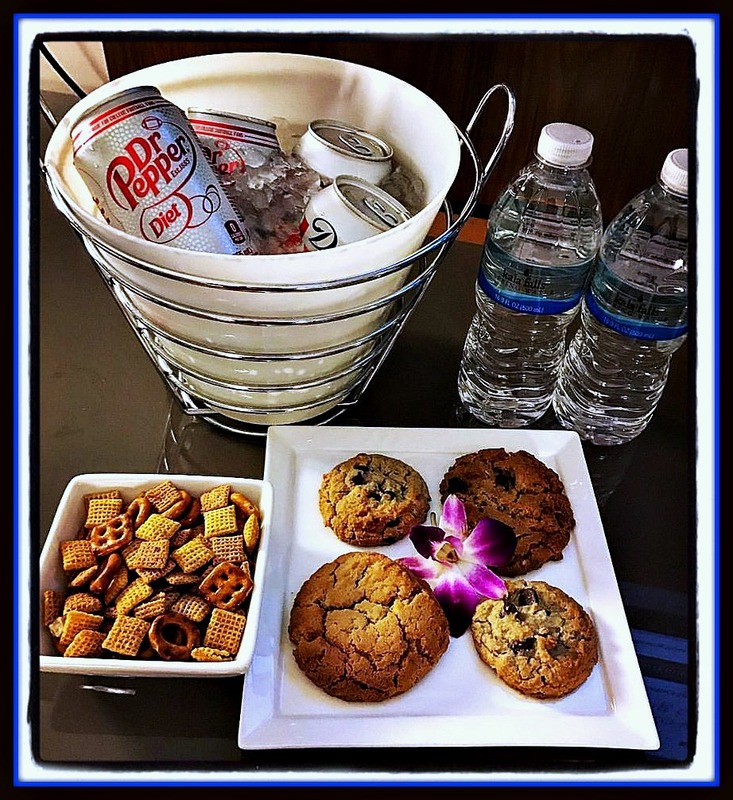 When we returned to the Marriott after dinner, a fun surprise was waiting for us in our room: our favorite drinks and snacks courtesy of the hotel’s management. It was such a nice, personal gesture! It had been a busy day, so we fell into bed and slept like babies. The following morning, we headed out for another day of food, wine…and a relaxing afternoon spa visit. On our way out, we stopped by the Marriott's Concierge Lounge for coffee and tea. 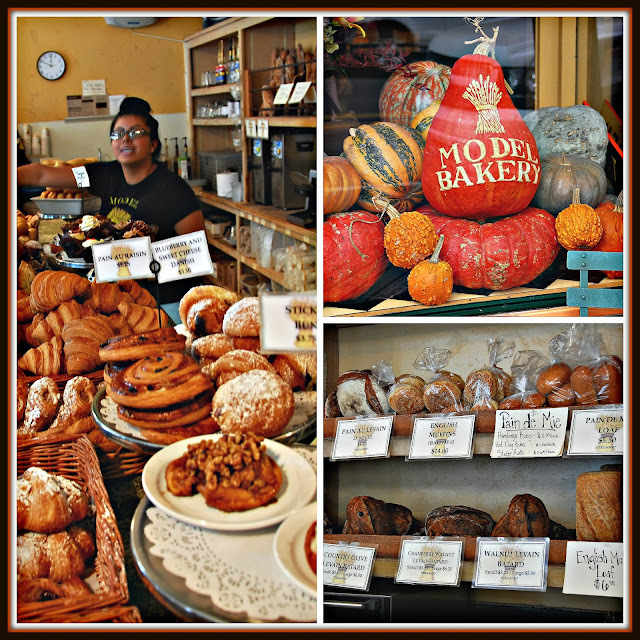 Our next stop was at Model Bakery, which has been a mainstay in St. Helena for three decades. Model Bakery is known for its artisan breads, wide range of baked goods, and their signature English muffins. There are English muffins…and then there are Model Bakery’s English muffins. I had seen them on Food Network, so I had to have one during our trip. These English muffins are taller and fluffier than the average English muffin -- they're life-changing when served toasted and slathered with salted butter! Model Bakery offers a wide range of delicious baked goods and breakfast sandwiches -- including this veg-friendly cheese version that includes spinach and tomato. It's truly a fabulous place to start your day! We selected a variety of pastries…and a couple of breakfast sandwiches made with those fabulous English muffins. 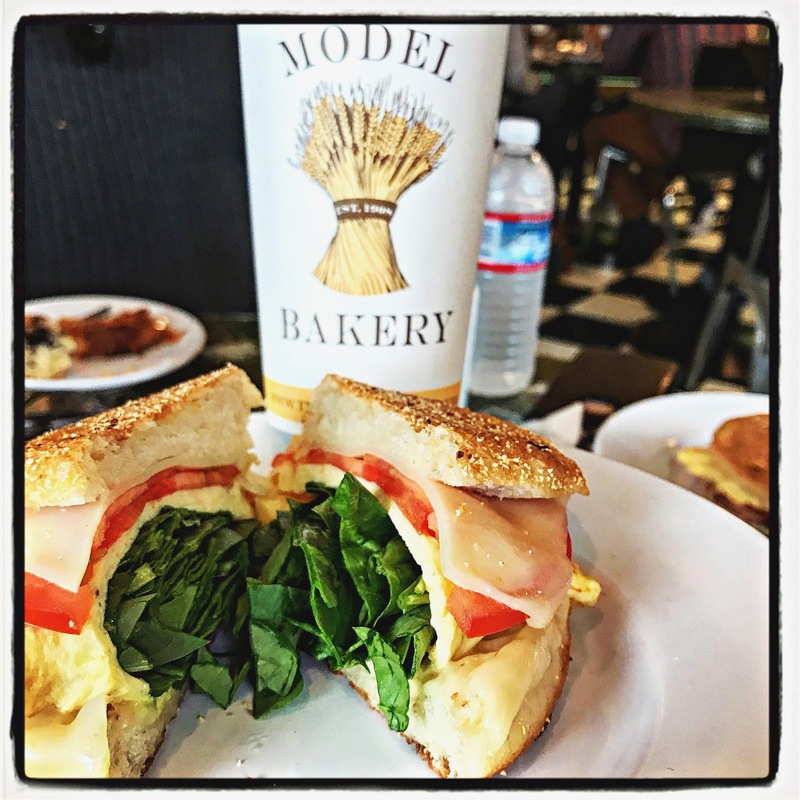 We find it’s important to start a day of visiting Napa Valley wineries with a full stomach, and I can’t recommend Model Bakery highly enough for an amazing breakfast or afternoon pick-me-up! 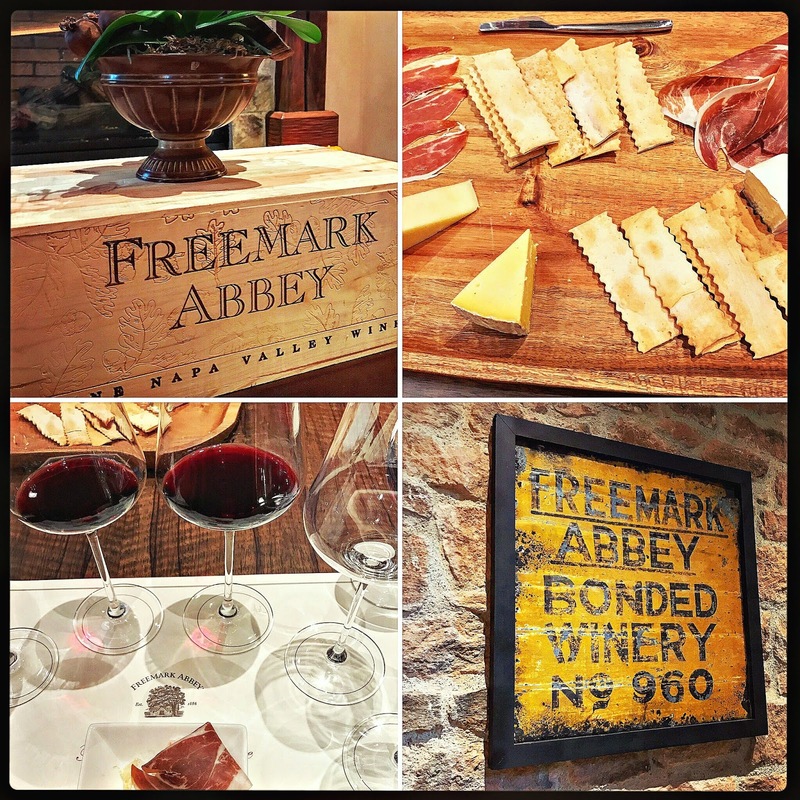 From there, we headed to Freemark Abbey winery. It's also located in St. Helena, which makes it a perfect destination after breakfast at Model Bakery. While at Freemark Abbey, we enjoyed a private Cabernet Comparison wine tasting and a fabulous locally sourced cheese and charcuterie platter. 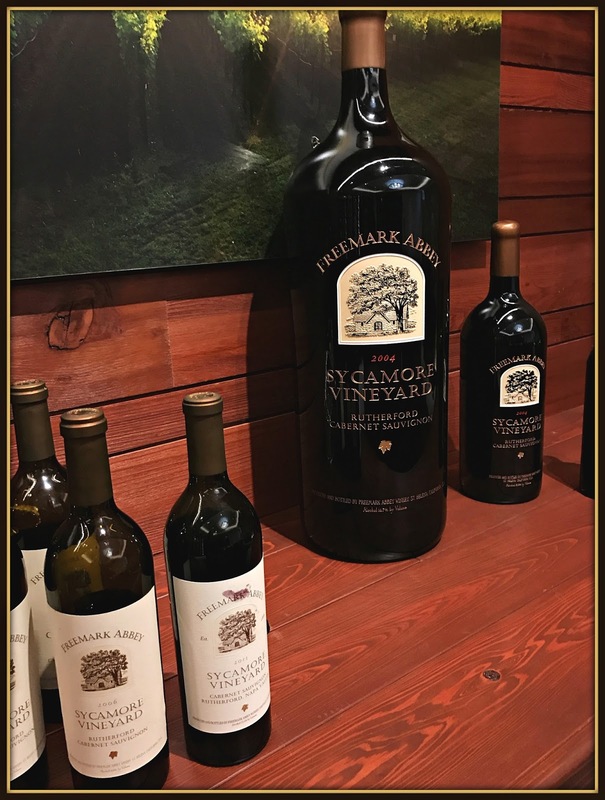 Freemark Abbey has been growing grapes in the Napa Valley for more than a century, so they know a thing or two about wine! 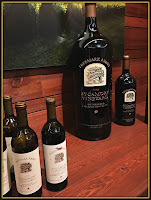 This private hour-long in-depth tasting took place in the tasting room's library and showcases Freemark Abbey's current release Single Vineyard Cabernet Sauvignon from the historic Bosché and Sycamore Vineyards on the Rutherford Bench. Our wine guide was very knowledgeable and friendly. She explained to us the subtle flavor nuances that the soil and climate of each specific region provides to its resulting Cabernet. Fascinating...and tasty! 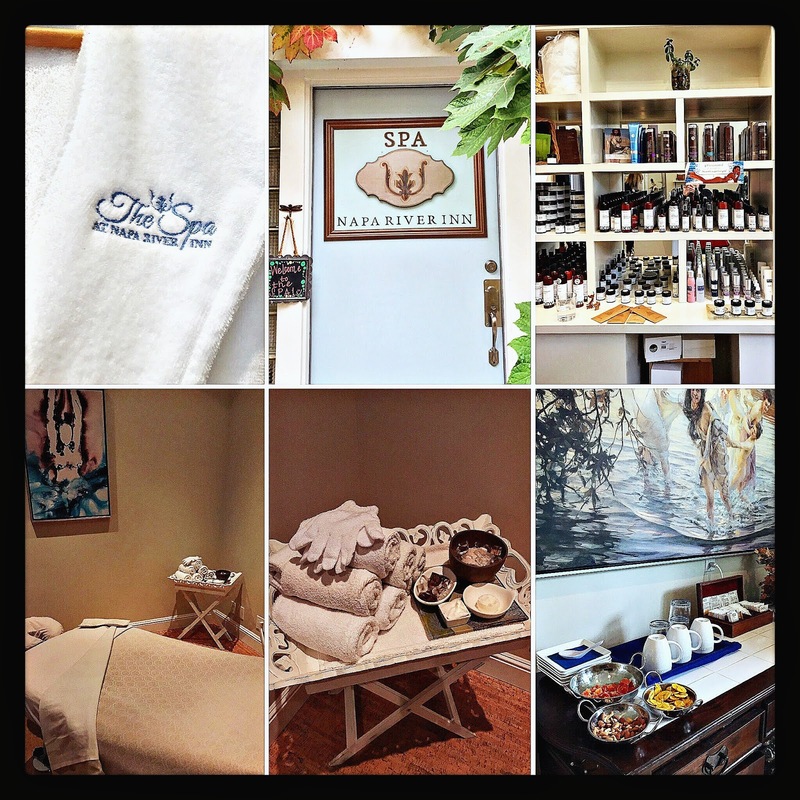 After our wine tasting at Freemark Abbey, we headed back to Napa for massages at The Spa at Napa River Inn. Good news: you don’t have to be a guest of the Napa River Inn to schedule a massage or other treatment at their spa! We loved how homey and comforting the vibe was in the spa’s cozy reception area. My social media assistant and I were quickly taken to our treatment rooms to enjoy relaxing 30-minute massages. The treatment rooms were inviting, with low lights and soft music playing. This was actually my first massage -- and it definitely won't be my last! 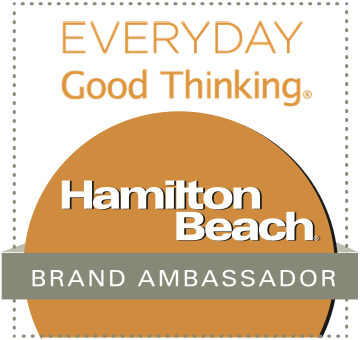 My massage therapist was friendly and very skilled – I was so relaxed that I briefly fell asleep during my massage. Afterward, we headed back to the Marriott to rest a bit before our dinner reservation at The French Laundry. We enjoyed a truly memorable, once-in-a-lifetime dining experience that evening – one I can’t wait to share with you next month! 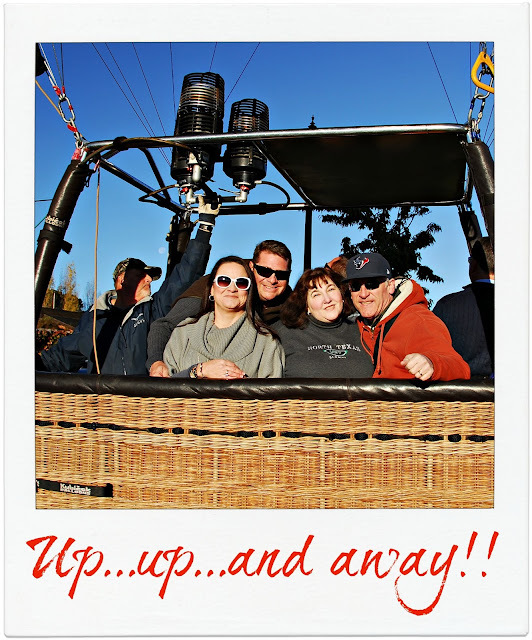 Our final morning in Napa started before dawn – because we had a sunrise hot air balloon ride scheduled with Napa Valley Aloft! We drove to the launch site at the V Marketplace in Yountville – about 15 minutes from the Marriott. We checked in at 7:00 a.m. and were offered pastries, fruit, and hot beverages to start our day. The friendly Napa Valley Aloft team briefed us on what to expect, and we were broken into two small groups – one for each balloon that would take off from the market’s parking lot. We walked over to the parking lot and watched the first balloon inflate, its basket fill with passengers, and then float slowly into the air. Then? It was time for our balloon to go through the same process. I’ll admit I was a little bit nervous during this prep. I've always had a fear of heights, but the Aloft staff did a fantastic job of reassuring me I would do fine. By the time we climbed into the balloon basket, I was all smiles! 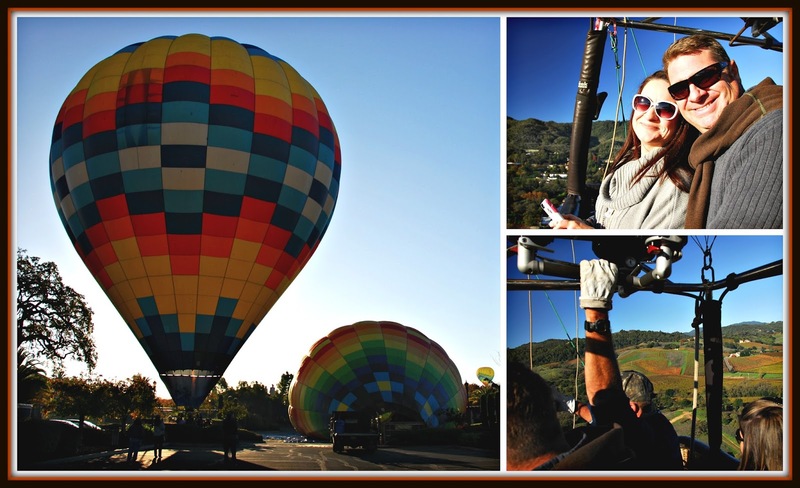 Unlike most other area balloon companies, Aloft only allows 8-14 passengers per balloon basket – instead of the typical 16-24 passengers. Here's The Weekend Gourmet team in our balloon basket minutes before takeoff! Like I said, I’m generally quite afraid of heights. However, I personally guarantee you there’s absolutely nothing scary about riding in a hot air balloon. The entire experience is very peaceful and calm…and the morning views of Napa Valley below you are simply stunning. Our balloon pilot was friendly and knowledgeable, answering our questions and explaining the process of take-off and landing in a hot air balloon. We couldn't resist a quick selfie to remember our experience -- and we even enjoyed a brief FaceTime with my in-laws back in Texas. At the end of our balloon ride, we landed in a park a few miles from our liftoff spot, where we exited the balloon basket and walked to a nearby van that was waiting to shuttle us back to the takeoff area. A Napa Valley Aloft hot air balloon ride is a must for any trip to Napa Valley. 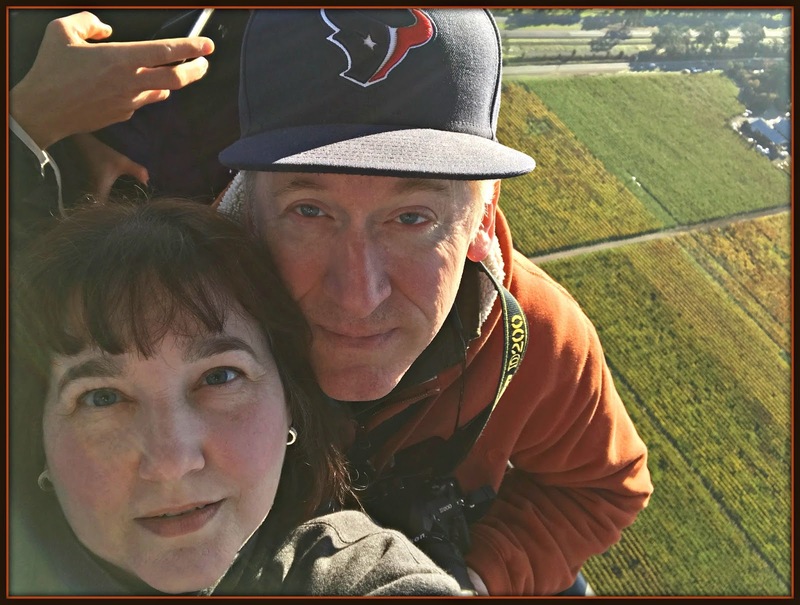 Our 45-minute hot air balloon ride is one of the most amazing things I’ve ever experienced – total bucket list material! 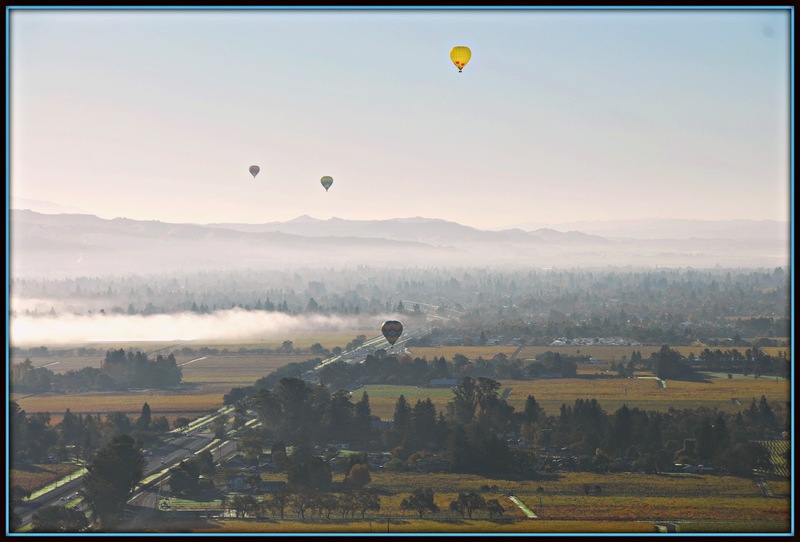 For an additional fee, you can add on a full sit-down champagne breakfast at Pacific Blues Café after your Napa Valley Aloft balloon ride. However, we wanted to stop in San Francisco on our way to the airport, so we opted to skip the full brunch. 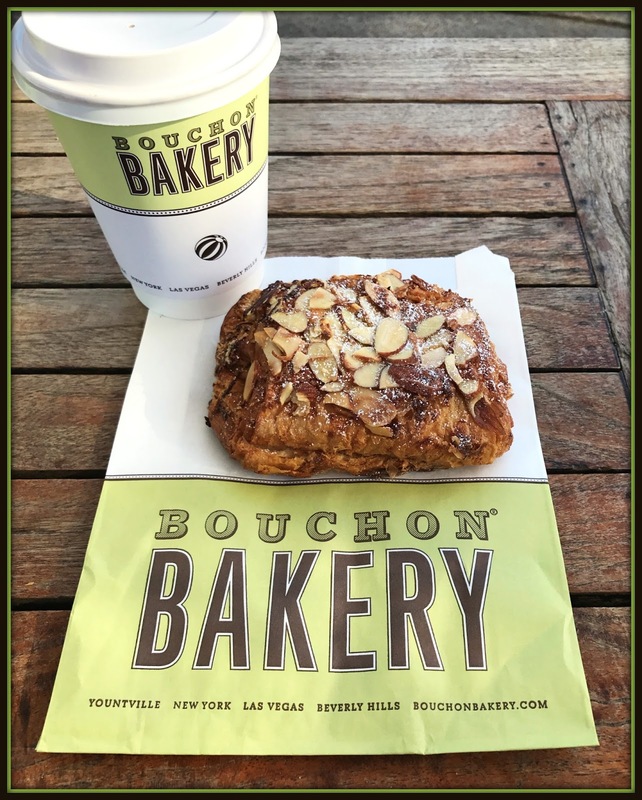 Instead, we walked across the street and grabbed pastries and hot chocolate at Thomas Keller’s Bouchon Bakery. While I ate my almond croissant, I took in the crisp Yountville air and enjoyed some people watching. Our trip was winding down, and we wanted to soak in as much as possible. 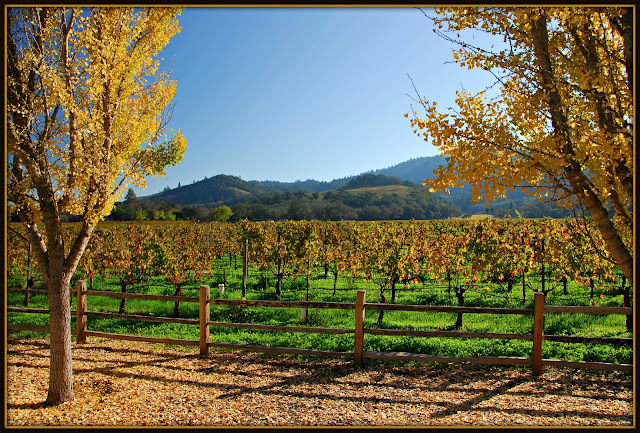 If I could bottle the fresh air in Napa Valley, I definitely would! After enjoying delicious pastries and hot drinks at Bouchon Bakery, we headed back to the Marriott Napa Valley Hotel & Spa to grab our bags and check out. 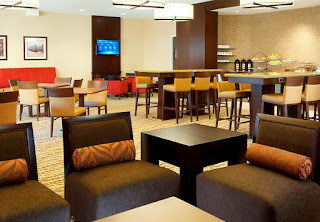 We especially appreciated having access to the hotel's Concierge Lounge, which included computers and printers so concierge-access guests can print out their boarding passes ahead of time. The hotel's checkout process was quick and simple. We jumped in our rental car, said a final goodbye to Napa Valley, and headed to San Francisco for a quick visit to Haight Ashbury before heading to the airport to fly back home to Texas. Stay tuned to hear all about the San Francisco leg of our trip before the end of the month! I can't say enough nice things about the Marriott Napa Valley Hotel & Spa. The staff is friendly, the hotel is beautiful, and the location can't be beat for exploring all that Napa Valley has to offer! To book a room, visit their convenient online reservation system. Disclosure: The Marriott Napa Valley Hotel & Spa provided a complimentary two-night stay to facilitate inclusion in this article. Far Niente, Markham, and Freemark Abbey wineries provided complimentary tastings. Model Bakery, Bounty Hunter, and Gott's Roadside hosted our meals. Finally, the Napa River Inn Spa provided a discounted media rate for two massages. All opinions provided are solely my own. Unless noted, photographs are copyrighted by Michael K. Garcia and may not be copied or otherwise used without prior permission.